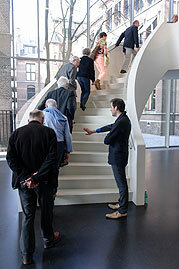 Project executed by invitation of the 's-Hertogenbosch Museum of Contemporary Art with financial support of Stichting Doen, Mondriaan Fund and bkkc. DEN BOSCH - Customs ensure that people are able to function in daily life, but sometimes patterns or behavioural codes are in place that are ineffective or even detrimental. 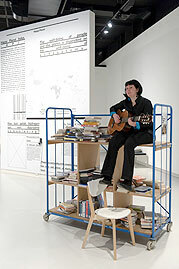 Museum visitors are also creatures of habit, so Sjaak Langenberg and Rosé de Beer invited guest museum attendant to experiment with codes of behaviour in the 's-Hertogenbosch Museum of Contemporary Art by making contact with visitors in unorthodox ways – an argument for more improvisation. In order to investigate 'the social effectiveness of defectiveness', guest museum attendant and social designer Sanne Ree Barthels regularly allowed her specially designed necklace to fall apart. The beads rolled all over the museum floor. Museum visitors helped her to collect the beads and became involved in a conversation. But sometimes no-one came to help her. 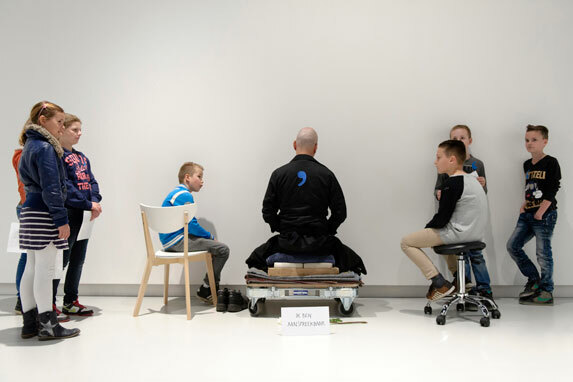 Theatre-maker Peter De Graef meditated for seven hours, in the lotus position with his face to the wall. 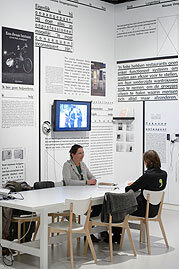 A sign saying, 'I'm approachable', invited visitors to break the silence. 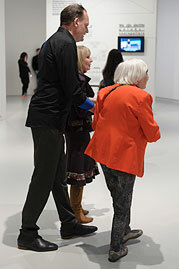 Blind museum attendant Vincent Bijlo reversed the roles by himself asking for assistance, and being led around. Similarly to Bijlo, physiotherapist and guest attendant, Paulette Verloop, also made physical contact, which repeatedly led to outpourings by visitors. Other attendants were: theatre-maker and city artist Lucas de Man, philospher Ann Meskens, NRC and Happinez columnist Marjoleine de Vos, radio maker Pat Donnez, city chronicler Eric Alink, the writers Mijke Pol and Lucas de Waard, medical entomologist Bart Knols, hairdresser Leona Priem and 'collector of beautiful moments' Janne Willems. 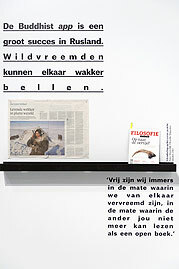 The interventions by guest attendants took place against the setting of a spatial magazine in the museum hall which Sjaak Langenberg and Rosé de Beer filled with text and films, about behavioural conventions in public space and improvisation, about empathy and the flip-side of altruism. 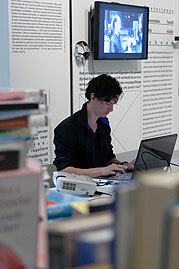 The project 'New Behavioural Conventions' was part one of a series of contributions from Langenberg & de Beer, to the three-year research project Reinventing Happiness, an assignment from the 's-Hertogenbosch Museum of Contemporary Art (Stedelijk Museum 's-Hertogenbosch) and guest curator Joanna van der Zanden. The goal of Reinventing Happiness is to develop alternative social concepts and to investigate if different definitions of happiness can provide new perspectives for the future. Other research contributions are being provided by Jeanne van Heeswijk in collaboration with Paul De Bruyne, and Frank Bruggeman.